An authentic vision for today's family Thoughtful and informative, Cahill's work brings fresh historical, theological, and ethical thought to the explosive area of family-deeply contested territory in today's cultural and religious skirmishes. As one group of social theorists and cultural critics points to rising divorce and illegitimacy rates as symptoms of unfettered individualism and moral laxity, another side notes that the "traditional," nuclear family is actually a product of the industrial age, with its strict gender roles, public-private split, and exclusion of an underclass. In the religious arena, evangelical- conservative vs. mainline-feminist lines echo these battles, contesting the authentic meaning of family within a Christian framework. Though "family" has been dissected in the academic and cultural wars, Cahill asserts that the usual religious agenda of restoring the traditional nuclear family is actually misinformed and misguided. It actually bolsters oppressive social, economic, and racial mechanisms that are destroying families at the bottom, middle, and even top of the ladder. Is there an authentically Christian notion of family? 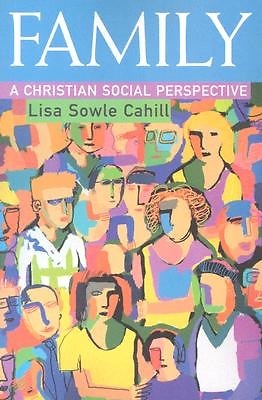 Cahill's contribution shows in a striking way how very different we are counter-cultural New Testament and early- church notions of family from our ideas of "family values;" how, throughout history, other fruitful Christian examples have emerged in the work of John Chrysostom, Martin Luther, and the Puritans; how, despite distortion by gender and class divisions, there develops a Christian vision of the altruistic family, animated by Christian discipleship to stand for compassion, generosity, and justice; how pertinent this vision of the "domestic church" is to public debate and public policy.